"Have you got a marker ump?" A question often asked by bowlers. Keep groundsmen happier, provide bowlers with a marker and reduce the scuffing up of outfields. 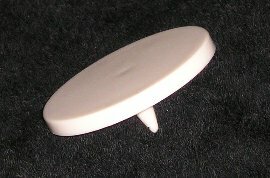 Here's a pair of white plastic bowlers markers 65mm diameter with a 20mm peg. Delivered in a resealable zip-lock bag.